In Wonder Boy III: The Dragon's Trap the once quiet town of Xenobia is under attack by fierce, gruesome monsters and no one can stop them! As Leo, it is up to you to save Xenobia and the world from danger as you navigate through several rounds in a race against time to reach your goal. Battle foes with your sword and jumping abilities. Look out for power ups that will increase your health and add to the amount of time you have left to complete each mission. Play alone or with a friend, who will take the role of Priscilla. 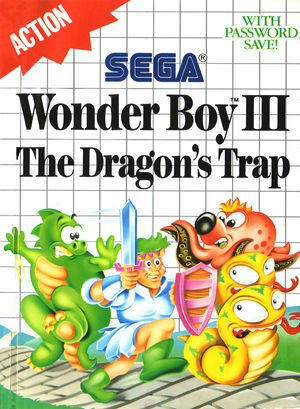 The graph below charts the compatibility with Wonder Boy III: The Dragon's Trap since Dolphin's 2.0 release, listing revisions only where a compatibility change occurred. This page was last edited on 31 December 2017, at 05:12.